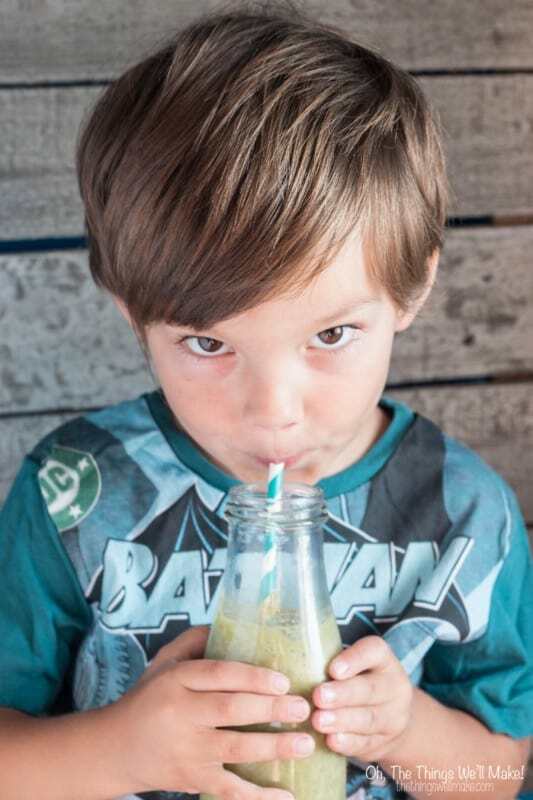 Smoothie Recipes For Kids: The Popeye Smoothie - Oh, The Things We'll Make! I have always loved using smoothies to sneak veggies and/or any other wanted supplements into my son's, and my own, diet. I'm not really “sneaking” them in per se because my son loves helping me make the smoothie, but smoothies just make everything more palatable. While I have to admit that I don't really love spinach, drinking a handful of it in a smoothie is actually a treat. When making smoothies with kids, I think it's really important to get them involved in making them with you. My son loves sitting on the counter and helping me throw different combinations of fruits and veggies, or combinations of our smoothie freezer cubes, into the blender and tries to guess what the final color of the smoothie will be. 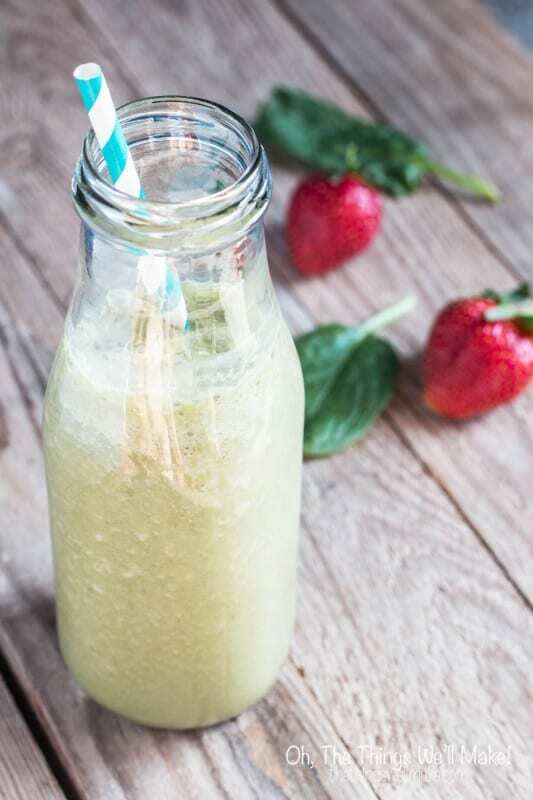 The sweetness of the banana and strawberries take center stage in this smoothie, and one doesn't even notice the spinach in it. Even if you do notice it, it isn't at all unpleasant. I like using this smoothie as an example to show my son that he should always try new foods. 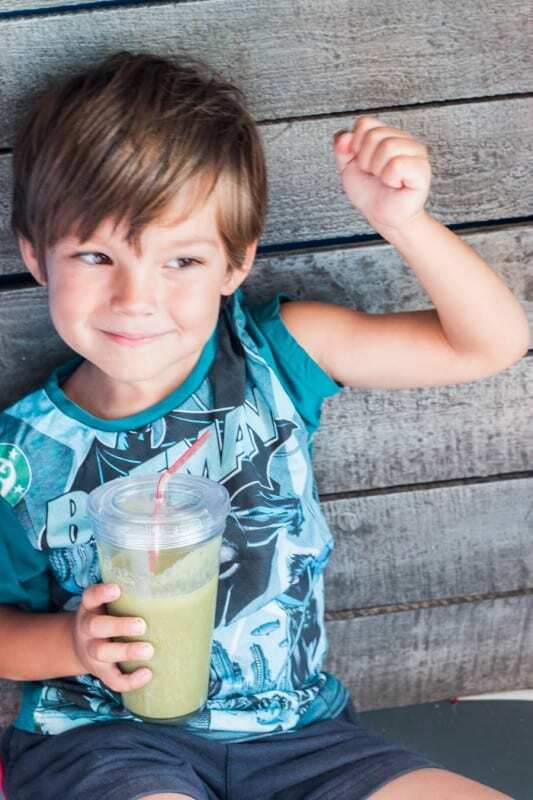 Even though he doesn't like spinach, he does like this smoothie. It's a great lesson to learn! If you want to add in some protein to make it a more complete meal or snack, you have several options. While a lot of people like adding in protein powder, I don't usually use it anymore. I can't really find any protein powders around here that don't have a lot of additives or artificial sweeteners. What I do instead is occasionally add in a pastured egg, making this a very complete meal. I understand that the idea of raw eggs has a certain yuck factor, but I assure you that you can't really taste the egg either; it certainly doesn't add an unpleasant flavor. Have I mentioned before that I don't like eggs? The idea of raw eggs does kind of gross me out (heck so does the thought of cooked eggs), and yet I love my chocolate mousse and aioli that use them, and I love adding them to smoothies! So, if I can do it… Haha- it's totally optional, so there is no need to add them. OK? I'm just mentioning it here because it is a valid option, but if you are grossed out about it or worried about salmonella, especially when serving to kids, then don't add them in. I call this the Popeye smoothie because of the spinach that gets added into it. Hopefully it will help my son grow as strong as Popeye when he eats his spinach. He'd probably rather be as strong as Batman, though. Or maybe even Thor and Hulk; he says they're the strongest of the superheroes! A study was done in 2010 that showed that kids ate more veggies after watching Popeye! I remember wanting to eat more myself as a kid after watching those cartoons. Too bad they're not on the TV anymore. Now, I guess I just need to find the cartoons for my son, so he'll want to start eating more veggies. Add all of your ingredients to your blender. You want to use a very ripe banana because they do a better job of sweetening your smoothie without needing any additional sweeteners. If it isn't sweet enough for you, though, you can add whatever sweetener you prefer. Blend all of your ingredients together. You can add in a little water and/or ice to get the consistency you prefer. The ice will thicken it a bit and make it colder, of course. You can optionally add in a raw, pastured egg or some protein powder. See how strong he's getting already!?!? As for the raw spinach in the smoothie, some may have heard to watch out for the oxalates and be concerned about consuming raw spinach. I have been researching the topic for a while and have found a lot of conflicting information, none of which is very conclusive for me. I think it's a good idea to eat a variety of foods and not eat any food in excess. My son doesn't drink smoothies every day, and, even though this is one of his favorites, he doesn't have the same smoothie every time. Sometimes we add in the spinach, sometimes we don't. We use a variety of fruits and veggies that are in season as well as our fruit smoothie ice cubes. 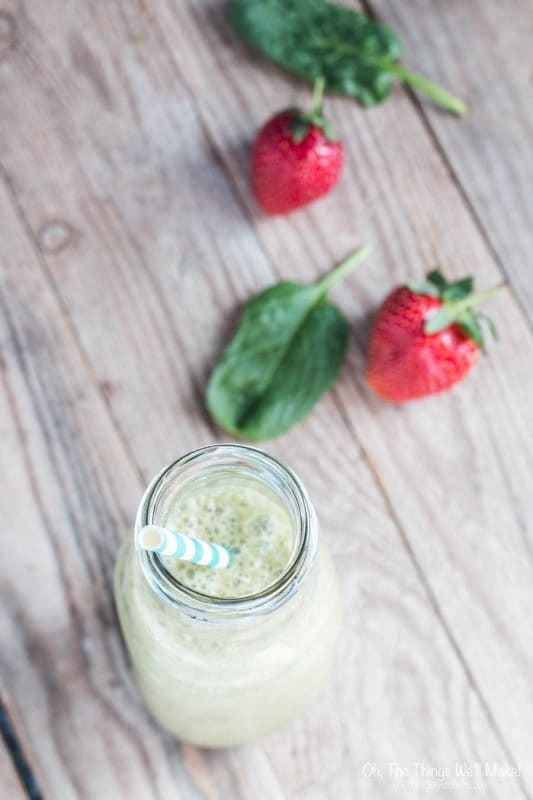 Because I do think it's important to have variety in your life, I'm working on getting over 100 healthy smoothie recipes together for you, and I plan on sharing them next time! 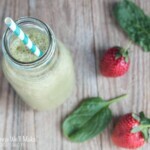 So, if you are looking for healthy smoothie recipes for kids (or adults), definitely come back soon! I love smoothies and have an 8 yr old that’s very picky and doesn’t care for them. I loved reading your blog about you and your son making the Popeye smoothie together. I’m going to try this too and look forward to seeing more kid friendly smoothie recipes from you. 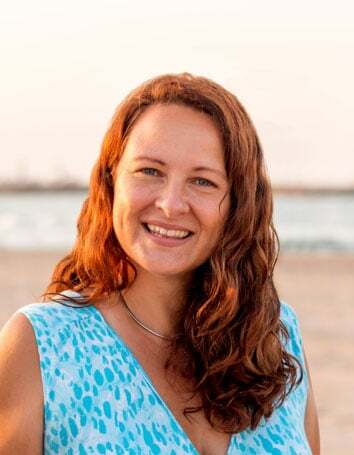 I also want to tell you about the best protein powder, no additives or artificial sweeteners, it’s whole-food plant-based, nondairy and so delicious ! Please email me if you’d like more info. I’m sorry to hear that your son doesn’t like smoothies. My son is four, and I’ve gotten lucky that lately he likes (or at least tries) pretty much anything that I let him help me make. I think it’s the pride he has in having made something “himself.” A lot of foods that he has said he doesn’t like in the past, he hasn’t given a fair try. We try to keep making him try at least a little bit at every meal, but having him help me is really helping to get him to try new foods. My son is a toddler, though, and perhaps that doesn’t work as well with 8 year olds. One thing that may work if your child has decided that smoothies aren’t the greatest thing is to make them really thick and treat them like ice cream. I love freezing fruits and veggies and making them into sorbets. (I have a watermelon and mojito sorbet up, and have been working on a couple that use coconut milk and are more like an ice cream.) Most kids love ice cream and smoothies aren’t that much different. It’s more of a psychological difference, I think.